Custom pewter kitchen sinks from Handcrafted Metal are available in a variety of shapes and sizes. Click on any sink below to see more pictures, and customize it according to your specifications! Each sink is available with drop-in mount, under mount, or flush mount rims. 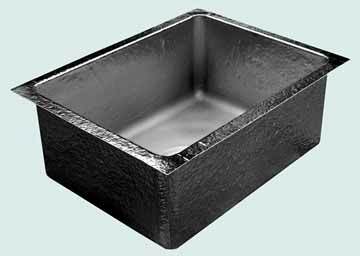 This sink can be used in the bar or kitchen and features hammered walls and a smooth bottom. Our welded construction and the rigid composite shell (not shown) provide durability and support. The thick shell also provides sound dampening and prevents condensation on the outside. Great to use for an ice bath. Final finish is semi-gloss on walls and rim, but the bottom of the sink has a matte finish.